Stormy Productions Blog: Radio Paradise iPhone app v2.0 coming soon! 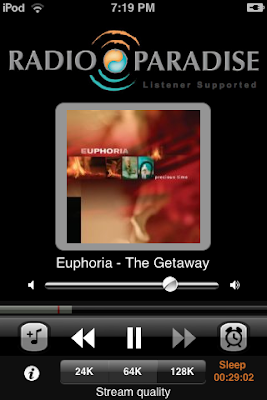 I've submitted the latest version of the Radio Paradise iPhone app to Apple for approval. This newest version will be 2.0. Based on Apple's current review times, hopefully it will be available mid-October. As is true with earlier versions, the app includes displaying the album artwork for the current song playing, along with support for viewing more song info (listener comments, ratings, etc.) via tapping the artwork. Tapping on the musical note brings up a "tunemark" feature for saving the song details to a list, emailing the info, or searching on iTunes for the track. Also noticeable in this screenshot is a new feature - or at least the button for the new feature. 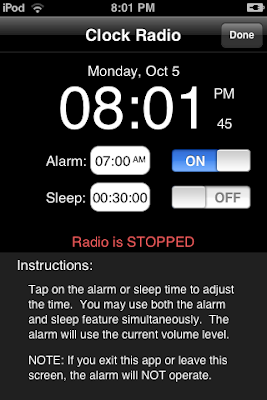 I've added an alarm clock and sleep timer feature. This will allow you to use the app as a clock radio - waking up to Radio Paradise as well as a sleep timer to have the app automatically stop after a set amount of time. In the above example screenshot, the sleep timer is currently active and is counting down from 29 minutes. Again, I'm not an artist or a skilled graphic designer, so the screen is pretty plain, but functional. You can have both the alarm clock and sleep timer active at the same time. In the above screenshot, the alarm is currently on and is set for 7am. Unfortunately, Apple does not allow 3rd party apps to run in the background, so in order for the alarm clock to work, the app must continue to be running. The screen can be turned off to save battery power, but the app still must be running. Since the radio playing depends on the Internet, the alarm clock feature includes a failsafe. If the Radio Paradise stream is down, or the wireless network is down, the alarm will detect this problem and will still play an audible sound - a simple "dinging".